WASHINGTON, D.C. -- The percentage of U.S. workers whom Gallup considers "engaged" with their jobs averaged 32.6% in June, largely unchanged from the previous month. An additional 50.7% of employees were "not engaged" and 16.7% were "actively disengaged." From January to June of this year, employee engagement has averaged 32.9%, one percentage point higher than the average for the same period in 2015. The percentage has been bolstered by a record-setting average in March. In general, employee engagement has been trending upward for the past three years. In June 2013, for example, the metric averaged 28.5% -- four points lower than the June 2016 average. 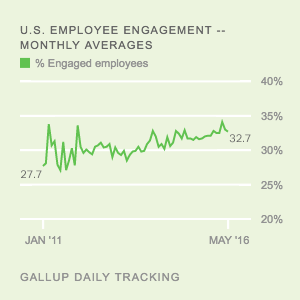 The June 2016 employee engagement average is based on Gallup Daily tracking interviews conducted with 6,994 U.S. adults working for an employer. Gallup categorizes workers as engaged based on their level of agreement with key workplace elements -- such as having an opportunity to do what they do best each day, having someone at work who encourages their development and believing their opinions count at work -- that predict important organizational performance outcomes. 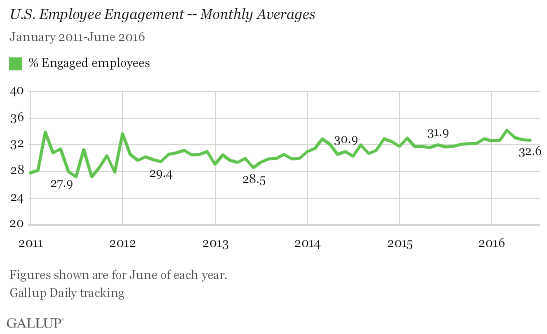 Employee engagement was unmoved from May to June, but it remains lower than it was in April and particularly March. Despite the drop, monthly averages continue to be higher than they were in 2015 and are among the best averages in Gallup's five-plus years of tracking this metric. The first half of July also looks strong, with weekly employee engagement averages reaching 33.3% and 34.1%. If these numbers can hold, July will likely mark an increase over the last few months. Results for this Gallup poll are based on telephone interviews conducted June 1-30, 2016, on the Gallup U.S. Daily survey, with a random sample of 6,994 U.S. adults employed full or part time for an employer, aged 18 and older, living in all 50 U.S. states and the District of Columbia. For results based on the total sample of employed adults, the margin of sampling error is ±2 percentage points at the 95% confidence level. All reported margins of sampling error include computed design effects for weighting.